The recent focus on the Yala National Park being overcrowded takes the minds of wildlife enthusiasts to the 20th century, the time when it was a pleasure to go on a safari in anyone of the island’s 26 national parks. 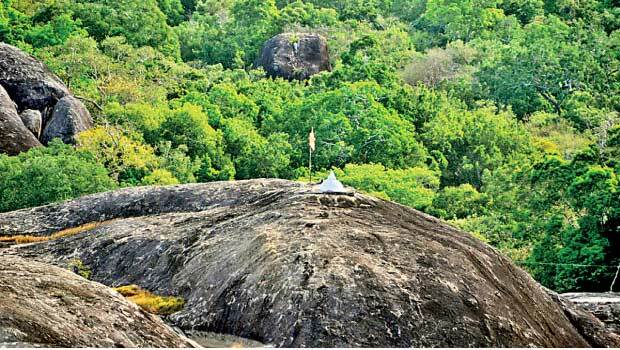 This was a time when Buddhist devotees trekked through the jungles of Kutumbigala to Kataragama, on pilgrimage. There are also records of a forest dwelling monk by the name of Ven. Thambugala Anandasiri inspiring the villagers to go on pilgrimage and even joining them on most occasions. 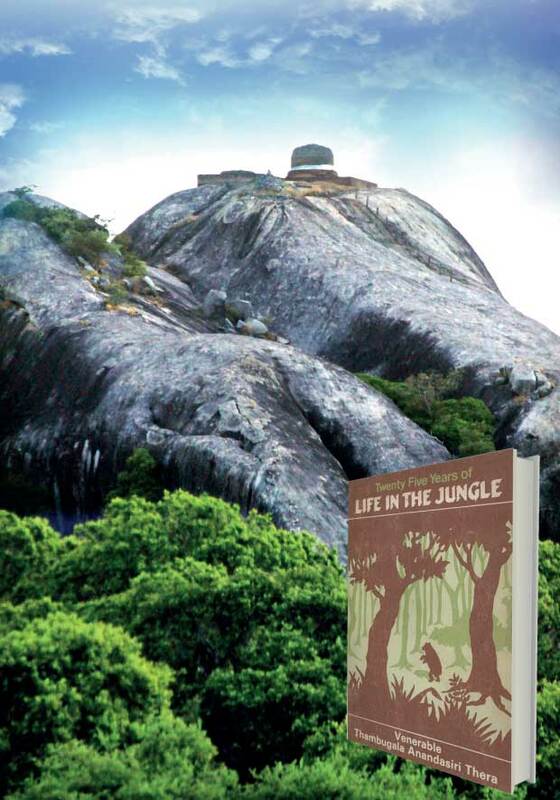 Memorable moments of the priest’s jungle travels have been included in a two-book series titled ‘25 Years of Life in the Jungle’, which was published by Dayawansa Jayakody & Company. As much as Ven. 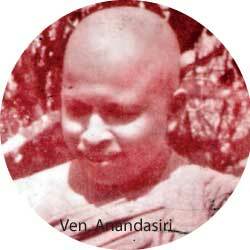 Anandasiri was a great exponent of the Dhamma, he was also well-aware of the jungle habitat and ways of the wild animals. He came to reside in the Kutumbigala jungles in 1954 and took great effort to clean and make conducive for living several ancient caves. During these times the jungles in the east of Sri Lanka weren’t very populated, hence wild animals were virtually undisturbed. The monk, during these travels, came across elephants, crocodiles, Pangolins, bear and different kinds of leopards, but there was never an occasion during these times of this monk’s life (1930-1989) that he had been harmed by any wild animal. Ven. Anandasiri in the book states that he practised the Dhamma and the Dhamma in return protected him. peace exists. He also talks about animals not showing the tendency to be aggressive when they see the ochre coloured robe of a monk. He based himself at Kutumbigala and there soon was a small committee (Kapakaru mandalaya) established to look into the needs of the handful of forest dwelling monks who resided there. At the beginning he was alone and had the habit of reciting the ‘Sathipattana Suthra’ and offering merit to God Skanda with the motive of obtaining protection, before going to sleep in the night. A few days later in a dream a man with a giant body emerged and taught him the stanza ‘Ithipiso bhagawa’ which is used by Buddhists to dispel fears during challenging times. There are ample instances in the book when the reciting of the first few words of this stanza had brought results. Unlike today, where even the ferocious leopards in the wild are harassed by jeep drivers, this was a time when the ‘cats’ roamed freely. The priest says in the book that the biggest leopards had been seen in the wilds of Lenama, an area which fell within the boundaries of Panama. The priest says that the Lenama leopard never flees when he sees a human and compared to other ‘cats’ isn’t ferocious. 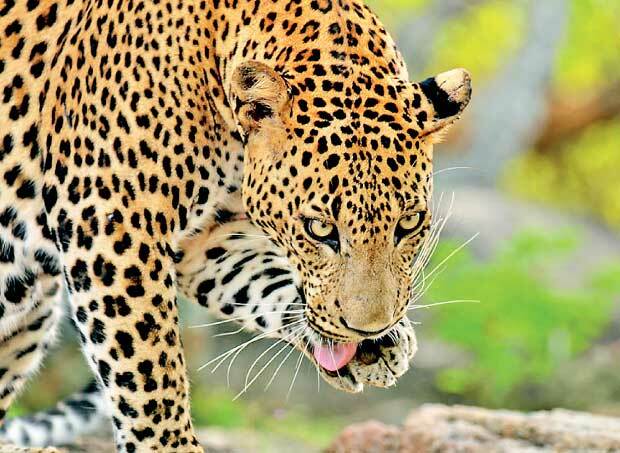 It is these leopards who are said to have wiped out an entire generation of veddas who lived in Lenama. Ven. Anandasiri Thera cultivated close relationships with the villagers of Panama. This village, during the time of the priest, was populated by Sinhalese people. But most of the men folks placed their beliefs in voodoo and witchcraft. The priest was able to convert most of them to Buddhism. A key feature in the society that helped the priest to teach them Dhamma is their culture of respecting elders, a habit which is present even today! Ven. Anandasiri was known as a revolutionary. He encountered some opposition when he sought membership in the order of forest dwelling monks. But the monk who spearheaded this movement, Ven. Kadavadduwe Jinawamsa, saw Ven. Anandasiri’s potential and allowed him to join the clan of monks who operated under the ‘Samathawa’ umbrella. Much later in years Ven. Anandasiri reached a milestone in monkhood when he was successful in getting the Kutumbigala National Park gazetted on September 8th 1973. This move immensely helped in the nurturing of the Kutumbigala Forest Hermitage, where the monk resided. Obtaining National Park status also helped Kutumbigala protect its valuable trees and herbs. The ability in villagers to using herbs for treatment underscores the presence of traditional healing methods in Sri Lanka, which was not mixed with the Indian Ayurveda system, which entered the country much later. Kutumbigala belongs to Kumana which is one of six villages that make up Panama ‘Paththuwa’. According to the priest there are 58 Buddhist worship sites in Panama. There were occasions when Ven. Anandasiri came across hunters and people involved in illicit activities such as graphite mining. He always preached Dhamma to those who were willing to listen. With those involved in illicit activities and who didn’t wish to be reformed he maintained a ‘didn’t see, didn’t hear’ approach. A key characteristic in the priest was that he was naturally friendly. The words he selected to speak often oozed with kindness. There are records where he had subdued ferocious animals merely by speaking kindly to them. Despite his travels and the many sermons that he made to propagate the Dhamma, Ven. Anandasiri always set aside time to meditate and reflect within. He was in all sense a true forest dwelling monk. Once the monk took a group to the lagoon in Salawa Forest. After spending some time at the lagoon the members of the group had started to meditate on the banks of the lagoon. After about two hours the priest had adjourned his meditation, a practice he observed given that he was in the jungle and animals approached people, regardless whether they slept, meditated or travelled. The priests had then seen a crocodile closing in on one of the member of the group who fast asleep. Seeing the priest walking briskly up to the person who was asleep, the crocodile panicked and slid back into the waters. The priest had told the group that those who live by the religion are protected by it and also obtain the power ‘to see’. Ven. Anandasiri had no enemies. His close associates state that he was a Buddha aspirant. Author Prof. Michael Carrithers has set aside a chapter for Ven. Anandasiri in his much acclaimed book ‘The forest monks of Sri Lanka’. In the mid 1980s the priest was forced to leave his forest hermitage in Kutumbigala and head to Monaragala due to the ongoing commotion in the east during this period. Despite being so humble and having a revered status bestowed upon him, a group of unknown gunmen shot him dead on October 3rd 1989. The remains of Ven. Anandasiri were cremated at the Borella Cemetery on October 6th. The wordings on the back cover of the book describes the monk’s assassins as a group of people who weren’t accustomed to any religious practice and didn’t have the habit of doing good deeds. Ven. Anandasiri was a good example of how to live life in keeping with Buddhas teachings. His life also underscores the core message of The Enlightened One that ‘all good things come with an expiry date’. Arisimalai encroachment: WHO IS TO BE BLAMED?